Secrets Hidden in the Glass by Cate Beauman is a romantic suspense novel and a part of the Carter Island series. Callie Davis, a world-renowned stained-glass artist, is in desperate need of a break from her hectic Manhattan life. Carter Island seems like the perfect place to disappear for a few weeks. What she didn’t expect was to fall in love with not only the island, but the handsome sheriff, Nate Carter. Despite the idyllic setting, there is one thing Callie cannot escape—her abandonment as a child by her mother. As old memories begin to surface, sparked by her surroundings, new leads develop in the long dormant case, leaving Callie and Nate wondering what really did happen to her mother all those years ago? Having read Ms. Beauman’s Bodyguards of LA County series, I was very excited to delve into a new world by an author I had previously enjoyed. This novel presented like a slow burn, with the story developing day by day as Nate gains Callie’s trust and their relationship blossoms. I loved the supporting characters and the descriptions of the island setting. It was nice to read something so thoroughly written, with all the nuances of Callie and Nate’s relationship, and the impact of Callie’s childhood, fully fleshed out. 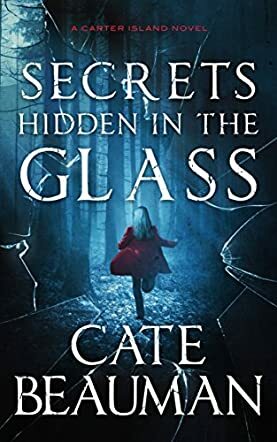 As with her previous series, Secrets Hidden Behind the Glass by Cate Beauman offers readers the chance to really get to know a set of characters and their surroundings, while still offering a suspenseful and engaging plot. I will definitely be following the Carter Island series with great interest.